Very cute ones. Love the idea of adding spinach puree !! 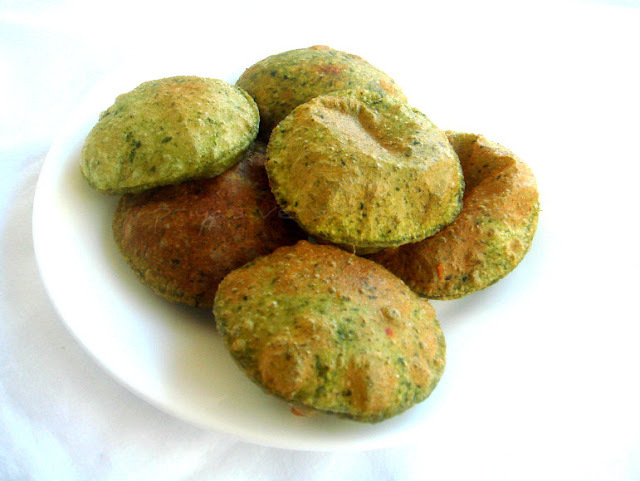 Delicious and healthy spinach poori. Looks very colorful and lovely. You are right! Pooris are always a hit with the kids. My daaughter likes it in her lunch box also. So once a week, it's our poori day! Looks yummy and perfect for kids lunch box. Please send it to my event. So cute and I want to eat them up! Perfect for the monsoon's Priya! good idea to add spinach in puris..Sure kids wont resist. delicious and healthy - wish I had one now!